When Mt. Pinatubo in the Philippines erupted in 1991, the catastrophic effects were felt across the country and even decreased temperatures worldwide after tons and tons of sulfur dioxide were discharged into the atmosphere. After killing hundreds and displacing so many more, who knew that after more than 25 years, this active volcano would become one of the most stunning hiking locations in the country? Mt. 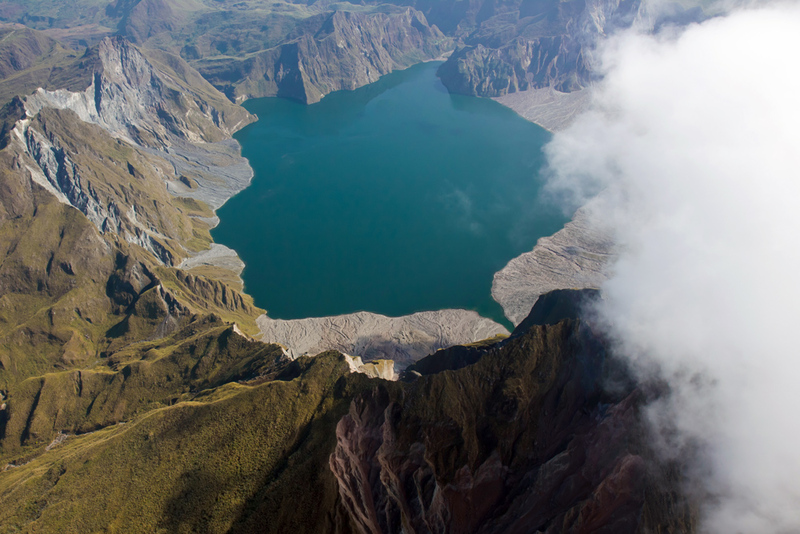 Pinatubo is now a popular destination for adventure travellers — known for its turquoise crater lake and sand dunes on which visitors can take 4×4 ATV rides. It is a hike that can be undertaken by anyone who is fit, and doesn’t require any special equipment, but you’ll need a durable day-pack or lightweight backpack for carrying food and water. Check out the website of Luggage Direct if you don’t already have one. The volcano is located about 130 kilometers northwest of Manila, the Philippines’ capital city. It’s about four hours away from the main Ninoy Aquino International Airport, but you can also get there via Clark International Airport in a much shorter time (less than two hours). There are many budget flights to Clark from Singapore, Macau, Hong Kong, Shanghai, Seoul and Busan, so it’s easy to include Mt Pinatubo on a Southeast Asian itinerary. You’ll need to go with a guide but as the hike is done in groups, it’s not expensive. Just Google ‘Mt Pinatubo tours’ and you’ll find plenty of information about getting to Mt Pinatubo using public transport or using one of the travel agencies licensed to sell tours to arrange pick-up from Manila or Clark. Prices vary widely between the agencies depending on the inclusions and the number of people hiking on any particular day, but usually average around $30-40 per person. To maximize your day, it’s essential to start your adventure very early in the morning. The registration cut-off time at the orientation area is 6:00am because the jeeps that are used to transport hikers to the start of the trek have to pass through an airforce target range before 7:00am. Some operators also organize overnight camping tours, but these also require the early start. It is highly advisable that you have a heavy meal for breakfast because you’ll be exerting lots of energy on the trek. From the orientation area, the next part is taking the 4×4 jeep ride to the base camp. The ride takes about an hour and half and the vehicle will be coursing through sandy terrains. It’s best to bring a dust mask with you for this. 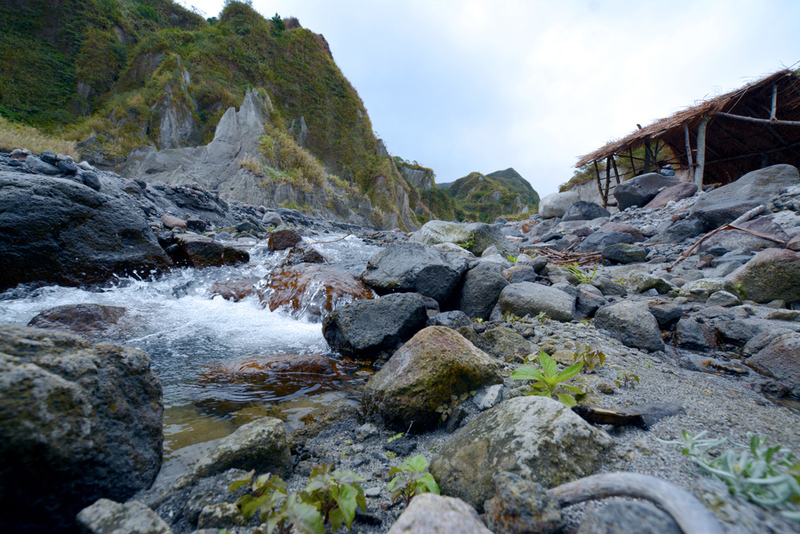 From the base camp, it’s going to be another two hours before you reach Lake Pinatubo at the crater of the volcano. This lake only came into being after the eruption of 1991. This is because a caldera formed after the major explosion and as time went by, water discharges along with rainfall slowly built up the 2.5-kilometer wide lake. Don’t be fooled by its rich turquoise color, though. The lake is still too acidic for swimming and the water temperature constantly fluctuates. Still, despite the absence of water activities in the lake, marveling at its beauty makes the entire ascent worth it. The stunning blue waters make it an awesome and unique sight to see. Sometimes it’s hard to think of it as a beautiful place because this is the spot where the most destructive volcanic eruption of the 21st century happened. It has a 2 out of 10 difficulty rating, but it’s still best to prepare. 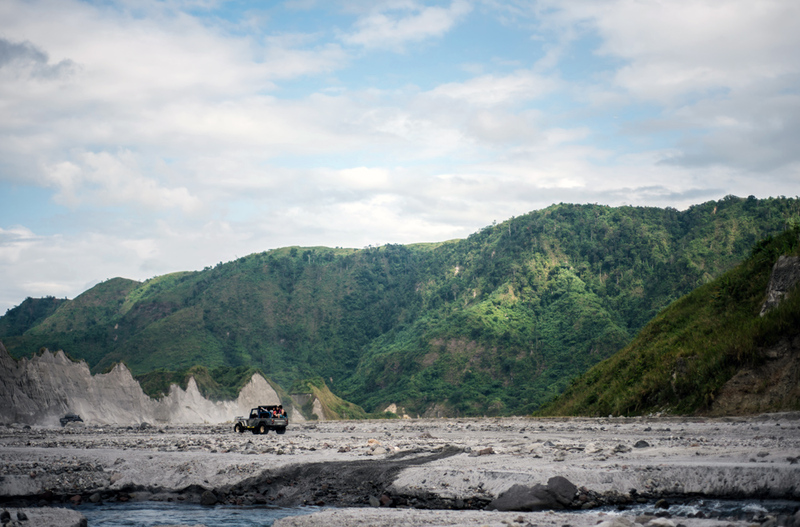 The volcano is fairly easy to get to but after typhoon Ketsana (locally known as typhoon Ondoy), the route of the 4×4 vehicles became shorter making the trekking route longer. It’s going to be a long, tiring walk over rough ground, roughly about 5 to 6 kilometers in two hours. Hikers over 40 are required to undergo a blood pressure check at the orientation area, and hikers over 60 are required to bring a medical certificate verifying that they are fit enough to make the trek. It’s best to go around November to February. Since the entire trek is done during daytime and the route is long, it’s best to plan your Mt. 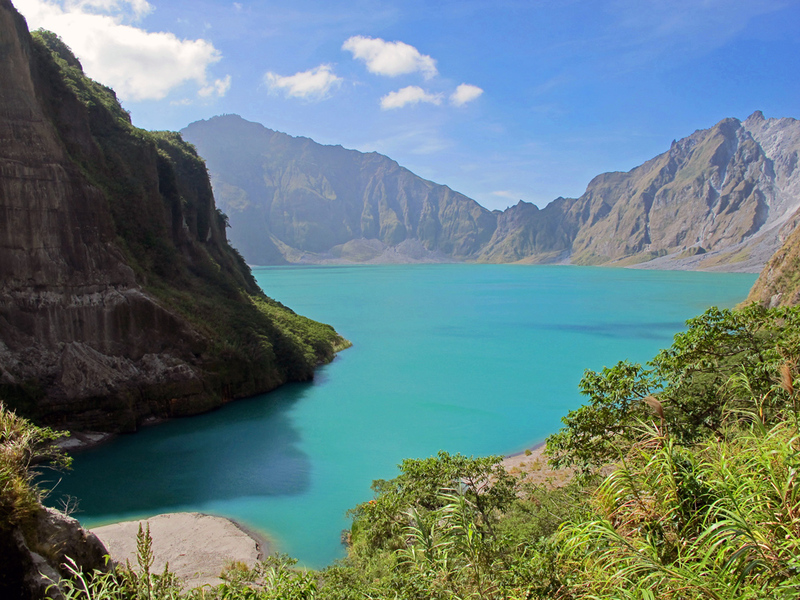 Pinatubo adventure for the cooler months in the Philippines. If it’s not possible to go during those months, bring plenty of sunscreen and a change of clothes because you will be soaked in perspiration by the time you get back. Some like to go in the rainy season when the sun is not so hot, but if it is too wet there is a risk of the tours being cancelled. Wear shoes that you are willing get wet. 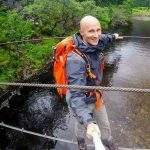 You will be crossing over rocky terrain and through small streams so wear comfortable, durable hiking shoes that are waterproof or at least weather-friendly. Sandals are not suitable unless they are the very sturdy leather type with toe guard and a strong supporting strap around the ankle. Bring snacks and water – lots of water. At least three liters of water per person is the recommended minimum. There are snacks and water available at the lake, but prices there are quite expensive because they have to be carried there by hand – so it’s better to bring your own and only buy supplies at the lake if you have underestimated what you need for the day. Don’t forget to have that heavy meal a few hours before beginning your trek! Put everything in waterproof plastic bags. You’ll be bringing snacks, extra clothes, personal necessities, and other things that you might need, so you will want to keep them dry. If your day-pack or backpack is not completely waterproof, then wrap everything inside in plastic bags. It might not look like rain when you start out in the morning, but by the afternoon weather conditions can change completely. Don’t forget to include a lightweight raincoat in your backpack as well.